Made from aviation-grade aluminum with single element processing by CNC machine.With matte black frosted finish on the surface. Left-to-right pressed clips instead of the traditional top-to-bottom design better to protect the filters and more smooth. Patented technology Adjust the CPL by gear driving plate. Bulged based mount screw for CPL filter. Easier to hold& install and avoid fingerprints on it. Kits includes 1 pc CPL, 3 pcs adaptor rings,free elegant leather case. NiSi V5-PRO 100mm Filter Holder System Kit includes the NEW V5-PRO 100mm filter holder, an ultra slim 82mm Circular Polarizer, four separate adapter rings (67, 72, 77, 82mm), and a leather storage case. The 82mm adapter ring attaches directly to the filter holder and functions as a main adapter ring. 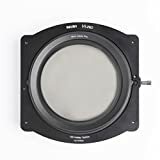 The filter holder can be attached to a 67, 72, or 77mm lens by attaching the appropriate ring to the 82mm main adapter ring, making this one of the most versatile filter holders available. The Circular Polarizer attaches to the filter holder via the 82mm adapter ring which can than attach to each of the separate adapter rings, allowing the Circular Polarizer to be easily used on any of the four lens sizes included.Compared to original V5,bulged based mount screw for CPL filter. Easier to hold& install and avoid fingerprints on it. NiSi V5-PRO filter holder features an exclusive patented design that allows the Circular Polarizer filter to rotate independently via a cog on the 82mm main adapter ring without disturbing other filters in use, meaning you no longer have to set your polarizer before inserting filters into the holder. Included is a leather storage case for all items. This entry was posted in Discount Photography and tagged 100mm, 52mm55mm58mm62mm67mm72mm77mm82mm, 67mm, 72mm, 77mm, Adaptor, Cokin, compatible, Filter, Hitech, Holder, lens, NiSi, Ring+82mm, Ring+CPL86mm, SinghRay, System, V5PRO by Ball Photo. Bookmark the permalink.